China Clay also known as Kaolin is a white, soft, plastic clay mainly composed of fine-grained plate-like particles. It is chemically inert, non-abrasive and has low heat and electricity conductivity. 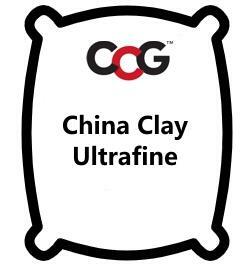 Plastic clays have a wide range of colours, but when fired, selected clays give results that are pure white. Plastic clays are used in the production of fine ceramics, for filling and coating of paper and in many other markets. China Clay Ultrafine or Halloysite is known as the whitest China Clay in the world and is sourced from Matauri Bay in Northland. Pure kaolin is the clay of choice for bodies that need to be clean and white. Many porcelains contain only a kaolin mix as their clay complement. But kaolins have relatively low plasticity when compared to other raw clay types. Thus in non-casting plastic forming bodies it is often not possible to achieve enough plasticity employing kaolin alone. Additions of ball clays, bentonites and other plasticizers are thus common. Where translucency and whiteness are paramount, highly plastic kaolins and white burning ball clays and bentonites can be used. Because kaolinite mineral has a much larger particle size than ball clay and bentonite materials, blending it with them in bodies can produce a good cross section of ultimate particle sizes (this imparts enhanced working and drying properties). Another advantage of the larger particle size of kaolins is that they are much more permeable to the passage of water. Thus kaolins, especially the larger sized ones, speed up casting rates in slurry bodies and drying rates in all bodies. Kaolins are employed in glaze recipes to keep the silica, feldspar, frit and other particles from settling out (the surface chemistry of the particles and their interaction with water are responsible for this behavior). At the same time the oxide chemistry of kaolin makes it the primary source of alumina oxide for glazes. Kaolin is a very refractory aluminum silicate. Kaolin-based bodies are used to make all kinds of refractory parts for industry. Kiln wash is often made from 50:50 mix of kaolin and silica. Cordierite is made mainly from kaolin. High heat duty grogs are made by calcining kaolin. If you use kaolin in your production there is good reason to be doing routine quality control to make sure it is remaining consistent. Kaolins can sometimes have particulate impurities (can cause firing specks) and exhibit differences in soluble salts content, drying shrinkage, drying performance and behavior in slurries. Clays are often the most variable material that production departments have to deal with. Kaolin transforms to mullite above 1000C, this is a key factor in the micro structure of porcelain and other types of bodies. This transformation is also exploited in engobes. Kaolin is the most common glaze suspender. Depending on the type of kaolin used, 15-20% should be enough. Many fritted glazes are composed solely of frit and kaolin. Some kaolins make the glaze gel, this is a helpful additional mechanism to keep it suspended.